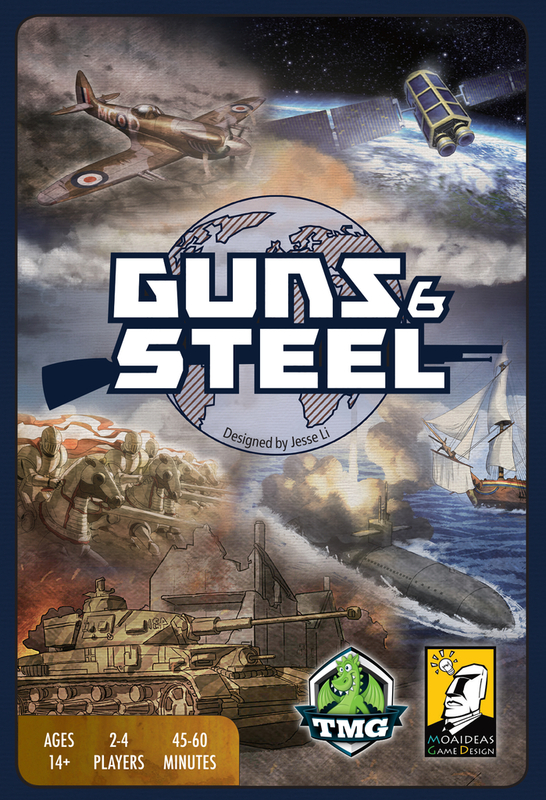 Guns & Steel is a game by Jessie Li, published by Tasty Minstrel Games. It is for 2-4 players. In this game, players will be competing through the ages to build the greatest empire the world has ever known. They will need to use resources to create new developments and technologies if they hope to have a thriving civilization. In the end, the player that can build the best civilization and score the most points will be declared the winner. To begin, the Civilization cards are separated by Age. If playing with 2 players, the cards with “2P remove” on them are removed from the game, not to be used. Each Age is then shuffled individually. A tech pyramid is then built with the Space Age cards on the top, followed by Earth, Oil, Gunpowder and finally Horse cards below. The Wonder cards are sorted into separate Ages. Wonder cards from the same Age are then compared by checking the indicator icons in the top right corner of the card. The card that is the leftmost card in each row will determine which Wonder card is used in the game. Each corresponding Wonder card is then placed to the left of the corresponding row. The remaining Wonder cards are returned to the box. Each player is given a set of 5 starting civilization cards; Reinforcement, Agriculture, Barter Trade, Mining and Warrior. The starting player is determined. If playing with more than 2 players, the third player in turn order will then place a card of their choice from their hand resource side up in front of themself. If playing with 4, the fourth player will then place a card of their choice in front of themself as well. The game is played with each player taking a turn consisting of 4 phases. Each phase will be performed in order. The 4 phases are resource phase, development phase, purchase phase and end of turn phase. The first phase is the resource phase. In this phase, the player must play a card from their hand face down as a resource. The next phase is the development phase. In this phase the player must play a Development card from their hand face up, activating it’s effect. There are 3 different types of Development cards that can be played; Civil cards, Tactic cards and Attack cards. Civil cards aid in resource production. Tactic cards activate other attack cards in the player’s hand or in front of them. Attack cards allow the player to attack all players using the total military strength of the cards in front of them. Players compare the strength of each opponent separately. The player wins if they have a higher military strength than their opponent. The defeated player must then suffer the listed penalty effects. It should be noted however, that a player that is being attacked can respond to the attack by playing any amount of cards with the response icon from their hand. They may also choose to deplete and flip over any of their attack or tactics cards that had been placed face down as a resource card. It should also be noted that the attacking player does not suffer any penalties if they lose. The third phase is the purchase phase. In this phase, the player is allowed to buy one civilization card from the supply. To do this, the player must deplete the corresponding resource cards to pay the required cost. This is done by flipping the resource card back over to it’s development side. The player may also convert resources into another type by using the resource conversion chart. The player may purchase any card in the pyramid. If the card is at the bottom of the pyramid with no cards below it, it only costs the listed price. However if there are cards beneath it, the card costs 1 extra resource of any kind for every card connected under it. Once purchased, the card is placed in front of the player, adding the military strength to their total. However, the effect of the card is not activated. The final phase is the end of turn phase. In this phase if the player has only 1 card or less in their hand, they must first check to see if they have satisfied the requirements for any of the Wonder cards. If so, they must choose and take one, placing it in front of themself. The player then returns all their face up Development cards to their hand. They may also choose to return any number of their face down resource cards as well. If the player has 2 or more cards in their hand, none of this happens. Play simply passes to the next player. The game continues until either a player gains the last Wonder card or buys the last Space Age Civilization card. At this point, the game ends immediately. Players will now add up all the points they’ve gained from their Wonder cards and Civilization cards. The player with the most points wins. This game consists of only a deck of cards. However, these cards are absolutely breathtaking. You would be hard pressed to find better looking cards anywhere else. Each one is linen finished and is fairly thick and quite sturdy. The iconography is not difficult to understand at all. I love how amazing each card looks. They each convey the era that they come from rather nicely. I especially like how that each of the Wonder cards are double sided and when you gain one of these, you have this beautiful looking art piece when you place it in front of you. Thematically it really brings everything together in my opinion. Besides the Development/Resource cards and the Wonder cards, the game also comes with several reference cards as well. 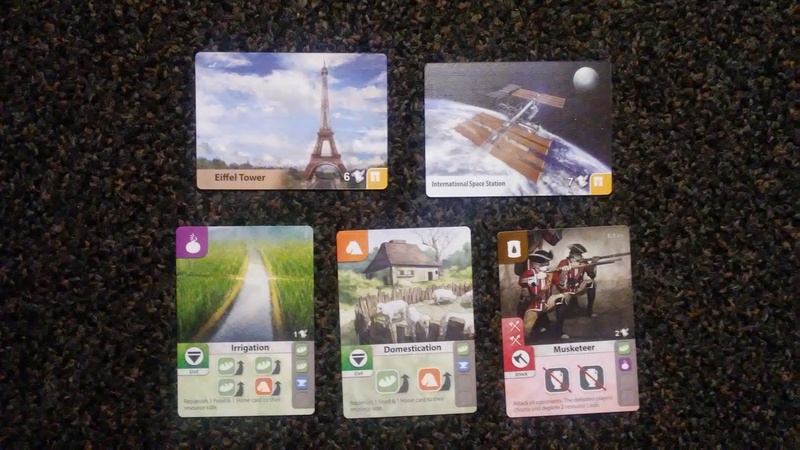 One card has how to setup the game and how to attack on it, while the others has an overview of a player’s turn as well as how the game ends and a nice resource conversion chart. The conversion chart is especially helpful for each player to have their own. Overall, I love the look and feel of the cards and think that they are designed beautifully. I’m thrilled. The rulebook for this game is a multi-folded double-sided sheet of paper. The different card types and descriptions are each explained in detail. There are plenty of great looking pictures and examples all over the rules. Details on attacking and purchasing are also covered in great detail, as is the different phases of a player’s turn. Also included in the rules is another resource conversion chart, this time explained, as well as a nice set of 5 frequently asked questions. I’ll be honest, the first time I read the rules, they made no sense to me. I kind of understood it, but kind of didn’t. So I gave it a couple of days and tried it again. This time, things clicked with me. I’m not saying that the rules are bad, or that you will have difficulty understanding them. I simply think that I was trying to overthink everything with what is obviously a fairly simple game to understand. I think if you read this, or someone else’s explanation of how the game is played before you read the rules, it’ll help. Overall I won’t fault the rules for what most likely is my own fault. Looking back at them now, I think they do a good job of covering everything in such a small space. I’m completely pleased with the result. Let me just say, I really enjoy 7 Wonders. I love building and creating my civilization to be the perfect one for my play style. I enjoy how my civilization interacts with other players. I love everything about the game. That’s why it’s one of my all time favorite games. So what does that have to do with Guns & Steel? Well both are civilization games that allow you to build and create a civilization while interacting with other players. Sound familiar? The thing is that unlike 7 Wonders, this game is a lot more functional as a 2 player game, plus it’s like half the size and still just as much fun. The bonus is that the game comes in a fairly small box so it’s easily transported. Of course there’s 7 Wonders Duel if you’re looking for a 2 player game of 7 Wonders, however I’ve yet to have a chance to play it. The thing is that after playing this one, I don’t really see as I need to. Both games seem to use the same pyramid solitaire style of tech tree. Just as an outsider, they seem rather similar. This one though seems a lot more thematic and streamlined than the other. That may not be the actual case, but from what I can tell it looks that way. The iconography on the cards in this game are extremely simple to understand. I like the tech tree in this game. I like that you can go for something cheap and less powerful as you continue to build up your civilization, or you can spend all your resources to go for something higher up on the pyramid to get some more powerful abilities. It’s a delicate balancing act. Just like with 7 Wonders, you have to be aware of what the other players are doing, especially with their military. It stinks when you get hit with a penalty because another player attacks you with a more powerful force. The game has a lot of strategy to it. Each time you’ll want to play the right card at the right time, especially since you can’t pick up any cards until you have 1 or less cards in your hand. It’s for this reason that every decision you make is crucial. Of course you really want to gain wonders, so you’ll be focused on doing everything you can to accomplish these goals. If you couldn’t tell, I like the game. I like it a lot. Fans of 7 Wonders or any of the other civilization games out there should really enjoy this one. It’s one that I would highly recommend. Overall, it’s a great card game and an even better civ game. Guns & Steel is a civilization style card game. It’s not a very long game but it does tend to be a bit longer than 7 Wonders. Most game sessions last around 45 minutes or so. The artwork for this game is really nice. I absolutely adore the double-sided wonder cards. The cards have a nice finish and are pretty durable. My first read through the rulebook was a little muddled but I finally got it the second time around. Not sure if it was me or the rulebook. Just something to possibly be aware of. The game itself is an amazing civ game, much like 7 Wonders but a lot more playable with only 2 players. I like the tech tree style pyramid and the strategy involved with this game. It really allows players to customize their play style and grow their civilization in a way that works best for them. I think fans of 7 Wonders and 7 Wonders Duel will really enjoy this one. Overall it’s a game that I wasn’t sure I would like but I found that I really enjoy it. I would highly recommend this game. It just might surprise you too. This entry was posted in Reviews and tagged board, board games, card, card games, games, guns, guns & steel, guns and steel, jessie, jessie li, li, minstrel, steel, tasty, tasty minstrel, tasty minstrel games. Bookmark the permalink.